We recently had the chance to review a Luxury Edition Outdoor Blanket from Mambe Blanket Co.
"Mambe Blanket Company was established in 1999. Living in the Northwest we were often faced with wet ground when trying to enjoy the outdoors, so we designed a blanket to keep us dry and comfortable no matter how wet the ground was. We tested and experimented with many different materials and construction techniques until we found the best combination that resulted in a super warm and soft blanket, 100% waterproof, and durable enough to withstand many years of regular use and machine washings. The first blankets were made for family and friends, but after realizing their usefulness and popularity, we began selling them to others. Our customer following has steadily grown since then largely through word of mouth. We love to hear from our customers about how they use their blanket. We are absolutely dedicated to providing the best product possible to our customers and hold integrity and customer service as our most important values. Thank you for your interest in Mambe Blankets. We sincerely appreciate your business." "The Outdoor Blanket Luxury Edition is made with fleece like you've only imagined. With super loft and a wonderfully soft texture you'll fall in love with it immediately. 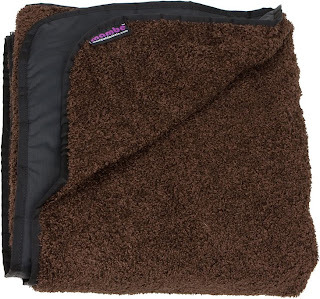 Just like the rest of our blankets, the Luxury Edition has a soft black 100% waterproof nylon lining, so it can be used indoors or out, in any kind of weather. Machine washable. The Outdoor Blanket Luxury Edition is new this season and exclusive to Mambe Blanket Co. Order now while we have inventory available!" What we thought: I am in love with this blanket! Seriously, I know it is mainly meant for outdoor use, but the fleece is so super soft and it is perfect for snuggling up with on the couch:) We have used it outside as well...it makes a really comfy and stylish picnic blanket...the kind you actually want to lay down on and it is big enough for our whole family yo do just that:) It is really well-made and we haven't had any issues with dampness, even on dew-covered grass, thanks to the awesome liner on the bottom of the blanket. The handy carrying strap makes it really easy to tote the blanket and the stuff sack($10) works really well to keep the blanket clean and compact in the truck. Mambe Blanket Co. has blankets for everyday outdoor use, extreme weather conditions, marine/boat use and more, all in a variety of stylish colors and patterns! Check them out for your quality outdoor blanket needs! ABCD Diaries gives Mambe Blanket Co. an A+! 20% discount through the end of March on Extreme blankets with discount code "WEATHER" or get a 20% discount for any purchase with the code "BLOG311" for the next 30 days. Win It: Mambe Blanket Co. has generously offered one ABCD Diaries reader "The Original" - 5'x7' - Outdoor Blanket in the color of their choosing- retail value $89! To enter, follow our blog via GFC and visit Mambe Blanket Co...then come back and tell us which color blanket you would choose in a comment below. 5.Make a purchase at Mambe Blanket Co +5 entries! Disclosure: ABCD Diaries was given a blanket for review purposes only. We were in no other way compensated. The opinions expressed in this post are ours and ours alone. I am following you via gfc and I would choose the chocolate. I follow you on GFC and I would pick the black one! I entered outdoor solar store. I entered Princess and Pea. I am already a GFC follower. If I am lucky enough to win I would pick Navy. These look awesome! I love the red and I follow via GFC, thanks! I love the French blue. I am following you via GFC. Burgundy is the color I would choose. I follow you via twitter too. I'm @brntsims on twitter. I like the Burgandy color. I follow on gfc. I would choose the red one. I follow and I would choose the Pistachio! I entered the Artiwood Letter giveaway! I follow on GFC and I'd choose the French Blue. I like the Deep Ivy color of blanket. I'm a follower via GFC. I 'like' The ABCD Diaries on Facebook. I'd like the navy one. I follow through google friend connect. I would choose the color pistachio.